When I moved into my new apartment I wanted to build a small hydroponic system I could use to grow basil just next to a window. Since I absolutely love to cook Italian food and fresh basil is a key ingredient this seemed like the best solution to enjoy my cooking to its fullest and practice the building of a new hydroponic system. I finally decided to build a very cheap and simple PVC system which currently hosts 6 beautiful basil plants that give me more than enough basil for all the Italian cooking I could possibly want. On todays post I want to share my system's design and description with you as well as some picture of my basil plants, showing you how they are doing under this great - yet very simple - PVC hydroponic growing system. The system I built can be classified as a continuous Ebb and Flow system. 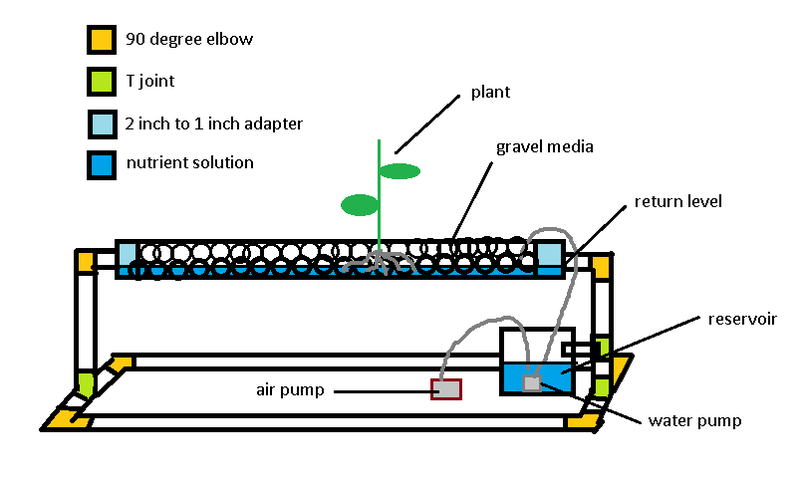 It basically has a 2 inch PVC pipe with a horizontal cut on top, a reservoir, an air pump, a water pump and a 1 inch PVC framework that also acts as a secondary reservoir for the nutrient solution. The system is filled with river bed gravel as a growing media and it can be used for the growth of almost any type of plant. Of course, any rocky media that easily allows nutrient solution flow can be used and a larger pipe diameter can be used to grow other plants such as tomatoes, cucumbers, etc. For larger plants a 4 inch diameter PVC pipe and a 2 inch frame work would be required. A diagram of the system is shown below (sorry for the poor drawing skills ;o) ). As you can see, the pump constantly sends solution from the reservoir below to the gravel bed inside the 2 inch PVC pipe located above it. The solution recirculates and goes down to reenter the reservoir. Even though the actual passage of the solution may seem "biased" towards once side, the truth is that a small part of the solution actually flows through the whole pipe and ends up draining through the other side as I have not noticed any difference in development between plants in opposite sides of the tube. Since there is a level that has to be filled within the tube before a return of solution is established there is a constant feeding of aerated solution for the plants. This system is very cheap to build and it can be made with 6 - 90º elbow joints, 3 - T joints, 2- 2' to 1' adapters, 5 feet of 2 inch PVC piping and about 10-15 feet of 1 inch PVC piping. You also need a container that can hold enough nutrient solution volume, a water pump and an air pump. The system provides very good growing conditions for plants and the gravel media provides adequate support for a wide host of vegatable varieties. This system is also great for strawberries and similar crops. Several improvement over this design are obviously possible and many will be featured on future blog post articles as I implement and test them. The above picture shows you my setup with the basil plants currently growing vigurously (they are currently about 60 centimeters high). Above the system you can have a small look at the high power LED fixture I built myself to provide these plants enough light (as hardly any light gets through the window). 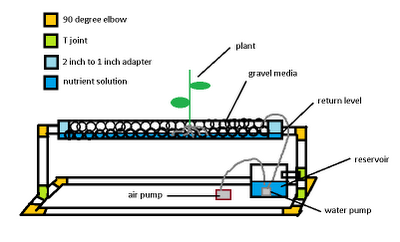 I hope you have enjoyed this article and decide to build your own simple home-made PVC hydroponic growing system. Make sure you leave any comments with questions or suggestions you may have :o). That is very cool. Something to think about in the future. Thank you for the comment Lola :o) I am glad you like it ! Dear Daniel, This is a very smart device. Please can u tell me how many LED lights are needed (dimensions & wattage) & for how many hours do the LED lights need to be left ON above the plants. I would also b interested in what you used to construct your LED lights. Thank you very much for your blog. I have been planning to put up a small hydroponic system at home but hasn't started yet. Your blog is very enlightening because of the simplicity of your system and very detailed. Thanks.